Tras un par de días de desconexión total (“fin de semana romántico obliga” supongo que lo entenderéis ;-) ) empiezo la semana enseñándoos el look que llevé para la fiesta de Juicy Couture. ¡¡Me chiflan los vestidos largos para el verano y os puedo asegurar que vais a ver más de uno por aquí!! Son cómodos, femeninos, chic, tiene estilo, fáciles de llevar… En fin que desde mi punto de vista son ideales. Este lo compré en un tienda de mi barrio por menos de 20 € y creo que es una clara muestra de que para vestir con estilo no es necesario gastarse mucho dinero. ¿Opináis lo mismo? ¿También os gusta los vestidos largos para el verano? After a couple of days of total “unplug” (“romantic getaway oblige”, I’m sure you’ll understand ;-) ) I begin the week showing you the dress I worn to the Juicy Couture party. I LOVE long dresses for summer and I can tell you that you’ll see a lot here!! They’re comfy, chic, feminine, stylish, easy to wear… Well from my point of view it is the perfect summer piece. I bought this one in a local shop for less than 20$ and I believe it’s a clear of example that style has nothing to do with money and that you can be chic without burning your credit card. Do you also think the same? BTW, do you also like long dresses as much as I do?? What a beautiful dress, love the colors! A mí también me encantan los vestidos largos, sientan genial. No matter this dress was USD20 or Eur 20...what a great price! I love it, the colours, and it fits you amazingly well! I can't wait to see the photos and the Juicy Couture in Spain! Que guapa ! me encanta el estampado y ese gran juego de colores ! I love your dress.. flow y, floral... mesmerizing! You look so cute! 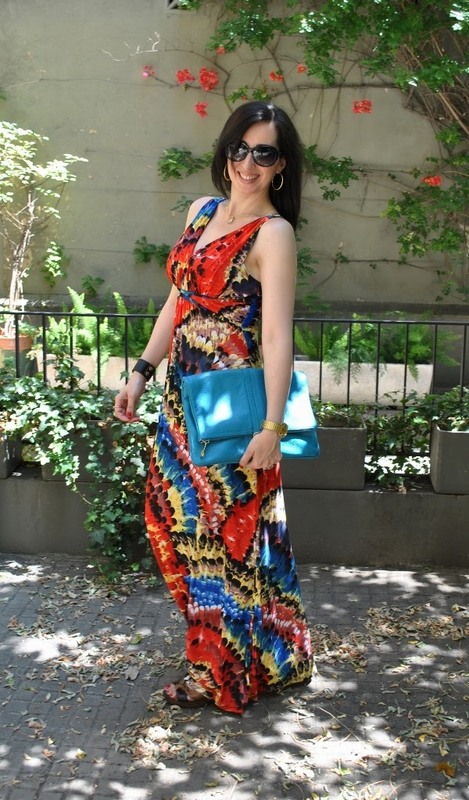 Love this maxi and I love your clutch! That is a beautiful dress! I didn't realize that the pattern was feathers until the closeup pics! I'm having a you choose cashmere giveaway on my blog, please pass by and enter I think you will love it. following dear... we can also follow each other on facebook and twitter if you want to... let me know ok! por fin te encuentro! ves? pues si que eras mi seguidora! por eso me sonaba tu cara! What a cute, summer-fresh outfit! The dress is colorful, the clutch is so nice! And loving your bracelet too! Hola preciosa estas super guapa, me encantó el vestido y la combinación. 150.000 visits on the blog!! Miss Top Ten Image featured on the It-List!! !